Since I first saw them in 2001, they’ve blossomed into a major rock band, and the new CD is stellar. Just watched the DVD of their 2003 tour on Sunday, and I’m psyched because I haven’t seen a full show from these guys, though they were great at the HFStival in May. Last outdoor show of the year – projected weather for Friday high 70, low 48 (brrr). We’ll be bringing jackets. No, Paul Rodgers is not Freddie Mercury, but no one could even try. I thought it was a fine idea to bring another legend and one of their contemporaries up on stage with them. They’ve released a live CD of a show from last spring in England, and it’s amazing. I saw Brian May once before, and it’s still one of my favorite shows ever. I’ve been hoping to see Brian with Roger Taylor for some time now, and this is easily my most anticipated show of the year. Too bad we have to go to Jersey to see it. I saw the Elevation tour there, and these guys put on quite a show. Can’t wait to see the new songs as well. Don’t know if QOTSA can compare to the last time I saw them (with Dave Grohl on drums), but I think they’ll be good. NIN is the treat here – I’m addicted to the video for “Only” these days. New CD definitely has some rockers, as opposed to the last one, and it should be a sweet show. Friday was pretty laid back. I got some groceries on the way home, walked and played with the dog as we waited for Jill. I watched Daily Show as I made pizza and salad for dinner, then we watched Threshold and Battlestar Galactica (I predicted that the second Battlestar was named Pegasus – bummer that we have to wait ’til January for part 2). She went to bed and I read the paper before sleeping. I thought I’d get up earlier Saturday to get to the National Book Festival, but didn’t get up until almost 10:30. Kinda of a problem since I’d targeted leaving around 11. I moved quickly, walking Illa and grabbing cereal for breakfast. I was on the road shortly before 11:30. I made one mistake – tried to park at East Falls Church Metro first. It’s usually a good choice – fastest to get to from the toll road, but if there’s a big event in DC, it fills up quickly. I saw it was full, so whipped out of there and over to West Falls Church. I don’t know about weekdays, but with the new parking garage, it’s never full on weekends. I started Neil Gaiman’s new novel, Anansi Boys, and was on a train in 10 minutes, with no seats, so I stood and read. By the time we got to the Smithsonian stop, the train was pretty packed, and it wasn’t much better on the platform, as people from earlier trains were still waiting to get off. I went south towards the Independence Avenue exit and got around the crowds. It was 12:30 by the time I got to the Mall, and Neil started his talk at 12:40. I got a program with a map of the grounds, found the right tent, then raced off to a portajohn, since I was planning on getting in the signing line quickly after his talk. I was right on time, because I noticed as I walked back to the tent I was pacing Neil as he walked in – so I guess the round of applause as I got there wasn’t for me. He did a short reading from Anansi Boys, doing the long Anansi story about Anansi tricking his wife and sons. He mentioned he would have liked to read the same section he did last year, about Fat Charlie’s hangover recovery, just because it was so fun to watch the sign language interpreter handle it. He had to stop several times as helicopters flew overhead. Once someone walked by screaming something about “join us for peace”, and Neil wondered aloud if he was having any success. Then he did a q&a session (best bit was when a girl asked him what “hair mayonnaise” and he told her that her quest was to find out and email him to he could put the answer up on his blog). Afterwards I quickly got over to the signing area where I got to the end of the line that had already wrapped around once (and would do so 3 more times while I was there). I continued reading Anansi Boys, switching to the Post for about 20 minutes while there was a light drizzle, then back to Anansi Boys, finishing about 10 minutes before I got to the front of the line, after I’d waited about an hour and a half. Great book, reminiscent of some of Douglas Adams’ finest stuff, and convenient as I was able to ask him a question about a character at the end which had confused me. Funniest thing was as I was about three people from the front, a young boy about 15 with curly bleached hair came up to one of the volunteers working the festival, and offered her money to get his paperback of Stardust signed. She turned him down, and he petulantly stalked off. The volunteers started talking about it, and when Neil heard, he asked how much the bribe was for. When he learned it was $5, he said “Five dollars? I’m worth more than five dollars!”, to which the rest of us agreed (like we wouldn’t have tarred and feathered the guy). This picture’s from right before I got to the front. After I got my books signed, I decided to head down to the peace rally. Lots of interesting signs and tshirts, but I wanted to see some of the music. As I arrived, Joan Baez was singing. I hadn’t seen her before, and she was good, very moving. Unfortunately most of the speakers that followed her weren’t, just reading scripts they’d brought and sticking to the applause lines. The two that weren’t were Jello Biafra (former Dead Kennedys singer) and Al Sharpton. Both were knowledgable and passionate – too bad the Democratic Party’s leaders aren’t more like them. There was a little too much preaching to the converted on Saturday. I understand the hostility and anger, but it keeps them separated from the other half of the country, and I’m not sure pulling our troops out entirely is the right move. I stayed for most of the Bellrays’ set before I left – was getting tired of standing. As I was walking back, I saw peace marchers, followed by a couple of Segway riders. I found out later in the Post that in addition to the peace rally and book festival, there was a national Segway convention in town (and two Nationals games). Of course there were no seats available on the Metro, but it wasn’t quite as crowded. When I got back to Falls Church, I called my mom, as my sister and her boyfriend were in town and showing up there sometime. They weren’t there, so I went shopping in my favorite music store, CD Cellar, to pass the time. $40 lighter and 14 CDs heavier (love that clearance and scratched CDs sections), I checked back, and they were going out to dinner at a Chinese place near downtown Fairfax City. The food was ok, but we enjoyed catching up. I called Jill and asked if she wanted me to bring her some takeout, but she decided she’d get her own on the way home from work. We had stayed out a while, and I thought Jill would beat me home, but she had to wait for her food, and I was just returning from walking Illa when she got back with Indian food. I fed Illa, then neither of us felt like doing much, so we watched two episodes of Firefly. Jill was stuffy and feeling like she was coming down with something, so she took two Nyquil Saturday night. Combined with her usual catch up on sleep, meant she was out until around 3:30 on Sunday. I got up and showered, walked Illa, made bacon and scrambled eggs while I watched Bill Maher. I went out on the deck to read the paper with a bone for Illa to join me, but we’d only been out about 5 minutes, when Fern (our neighbor from the down the block who’ve we’d known since she’d busted up my car by not leaving hers in park) went out back to play catch with her lab, Bear. Illa was curious and Fern had mentioned we could join her, so I got the long lead and attached the hands free buckle to my belt. Illa had a lot of fun and got the hang of catch pretty quickly, and ran around like a maniac. Only problem was right at the end he was running at full speed and when he reached the end of the lead, ripped my belt off (it was an old belt, worn at that spot). He also managed to tear down the metal trellis we had in the back. I tried to replace it but two of the legs were rusted and snapped off – not sure if we’ll replace it or not. I trimmed the hedges and swept the deck while I was working with it. Illa was pooped after that, so he was happy to sit on the deck and chew his bone while I read the paper. I finished around 3:30, as Jill was just coming downstairs. I made us some BLTs since we had fresh bacon and tomatoes, then we both read some (EW for me, Martha Grimes for her). We left around 6 to see Neil Gaiman do another reading and signing at the Borders in Baileys Crossroads. We got there around 7 and the parking lot was packed. I figured it was going to be busy (especially since the day before at the festival the volunteers were telling people he had to leave at 5, but he was doing this signing the next day), but it was a sizeable turnout. Good thing I didn’t want anything signed, as I saw someone who arrived just after we did got number 259 in line. The reading this time was about Fat Charlie summoning his brother, and the q&a was decent (although there were a couple repeats). Afterwards, we went over to my mom’s. She needed a new mouse, so I brought her one of my unused ones (I only use glidepads), and I had made some more Daily Show DVDs for my sister. Found out I needed a serial adapter for the mouse (forgot her computer was old enough not to have a PS/2 port), and I had to install a powered FM antenna on her stereo as well. We chatted for a while, then left around 9:30 as we hadn’t had dinner. At close to 10 on a Sunday evening, most restaurants were closed. We cruised through Fairfax City and the new town center at Fairfax Corner without luck. I thought maybe Logan’s Roadhouse at Fair Lakes might have something (we were trying to avoid fast food or TGI Friday’s), but they were closed, but I remembered I’d been to the Blue Iguana cafe around the corner, and they were open with a late night menu. Not bad, we both had soup (lobster bisque for me, french onion for Jill, then the southwestern spring rolls, then the Mediterranean salad with grilled steak (ok, I’m hungry again thinking of it). We got home a little after 11, vegged a little, then walked the dog and headed to bed. Two of my favorite creators, interviewed together. JW: I find that when you read a script, or rewrite something, or look at something that’s been gone over, you can tell, like rings on a tree, by how bad it is, how long it’s been in development. JW: There’s really no better way to put it. Been getting to bed after midnight or 1 and up by 7-7:30. I’m dragging today. Had steaks for dinner, watched some HDD’s Daily Show. Watched Lost and Invasion last night. Liked Lost, not sure about Invasion (Threshold is superior). Had some frozen chicken cordon bleu with fresh green beans. Tuesday Jill was working, I had some leftovers and watched Bones (ok), My Name Is Earl (funny – I like Jason Lee), and The Office (Steven Colbert is uncomfortably good – and I hate office “parties” you have to pay for yourself). Monday Jill was also working, I made pasta and sauce for lunch for us the next day, and buffalo wings for dinner as I watched the Redskins make an incredible comeback against the Cowboys (in Dallas!). The ‘Skins still don’t look that great (Brunell is creaky), but that was a fun game. alternate scripts for “Soul Hunter”, “And the Sky, Full of Stars” and “The Exercise of Vital Powers”. …a six or seven page, single spaced outline of the ENTIRE FIVE YEARS with Sinclair still in place. The document makes for fascinating reading when compared with the series as it developed. NOT ONLY THAT, but the same document has a brief outline for A POTENTIAL BABYLON 5 SEQUEL SERIES, which would have been entitled BABYLON PRIME. The show, that is, not the weekend (ok, it’s actually the name of the movie and Firefly is the series, but I’ve got a theme going). The weekend’s been pretty busy. When I went to see Terry Pratchett Tuesday, my car was giving off noxious fumes, and initially I thought it was because I parked in a parking garage. But they were still there Wednesday. So I dropped my car off Wednesday to get it looked at. That meant I got up at 6:30 Thursday and Friday so Jill could gice me a ride to work (could have taken the bus, I guess). They cleaned the fuel injectors and it’s much better now. We were home so early at night and nothing planned, so we started watching Firefly, to prepare for the movie in a couple weeks. Jill got hooked on the pilot, and we watched another two episodes Friday. There was another reason not to do much on Friday – Illa darted off after a cat and Jill got burns on her fingers trying to pick the leash back up. We also watched Threshold, which was ok (dialogue left something to be desired, but the plot was good). Saturday I was trying to finish some DVDs and upload a concert to archive.org. Also watched Bones, and a preview DVD of How I Met Your Mother and Everybody Loves Chris (the first two starring Buffy alums, second featuring Chris Rock’s voice – if you’d follow either, you’ll like the shows, if not, don’t bother). Jill ran some errands, then we went over to the Fairfax City library book sale. On the way there she couldn’t find her wallet – eventually figured out she’d left it at Nordstrom and had to go back. I made steaks and she cooked green beans for dinner, then we read for a bit, then I went to see Quitter UK at Iota (CD release show). I missed Anthony Fiacco and the Echoes, but I’ve seen them before and they’re pretty good. The club was pretty crowded, close to sold out. The band was in good spirits, helped by a couple people buying them rounds of liquor. They played some new covers (Elvis Costello’s Radio, Radio, a polka version of Van Halen’s Jump, and Til Tuesday’s Voices Carry – Jump was very funny, especially when people on the floor started jumping). Scott had a nice new section on the bridge to “All That She Pretends” that was reminiscent of when he segued into “Silly Love Songs” (it’s also on the recorded version), and I like the Beach Boys like finale to “Young Again” more and more every time I hear it. Today, more DVD work for me and more errands for Jill, then the highlight of our weekend – Illa’s first bath. He was not happy about that. Next – burgers, Simpsons, and Family Guy (and maybe more Firefly). 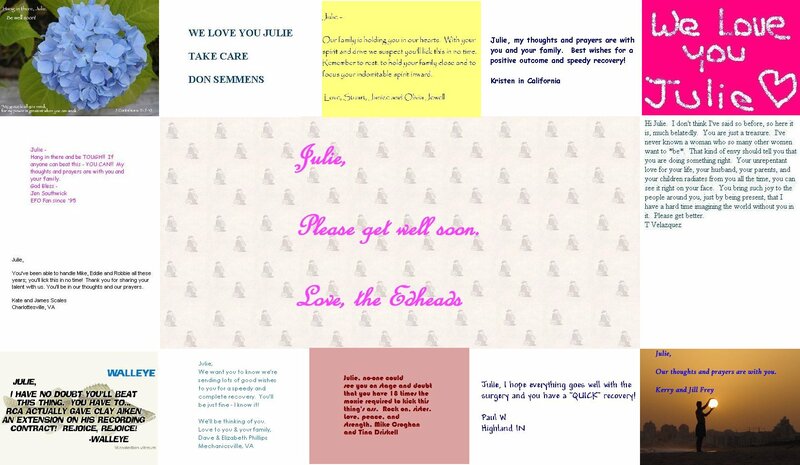 I was thinking about something the edheads could do for Julie, and I thought a giant card we all signed might be nice. Not very practical, unless we did it on the web. So I had people make little .jpgs of messages to Julie, then send them to me, and I stitched them together and put them up as a web page here. The Tipitina’s Foundation, in the wake of the devastation caused by Hurricane Katrina, is committed to saving the culture of New Orleans. The first step we are taking is to locate all New Orleans artists and their families and then find housing for those who need it. He came to Olsson’s at Courthouse last night to talk about his new book Thud. He was funny, good stories as usual (and told us about the next four books he’ll write), but I didn’t stay for the signing. I was going to buy the new book, but apparently they ran out (still a long line, would have been 155th or so). When this was relayed to Mr. Pratchett, he praised the gods – authors on long tours with tired hands apparently wish for this sort of thing. I took a picture, but it was with the Treo and you couldn’t have picked him out. That reminds me, my favorite co-author of his, Neil Gaiman, will be in town next weekend; Saturday at 12:40 as part of the National Book Festival and Sunday at 7:30 at Borders (Bailey’s Crossroads). We’re sad to report that within the last two weeks, our own Julie Murphy Wells has been diagnosed with breast cancer. Because of the aggressive nature of treatment necessary (surgery and therapy), we will be forced to cancel all of our performances for the next four weeks, at least. All the dates that are cancelled are listed below. On Thursday, September 15, Julie will undergo surgery for removal of the malignancy. While initial test results give reason to believe that the tumor is contained and hasn’t spread, nothing will be definite until the surgery takes place. At this point, Julie wishes to go public with her current illness as she could use all the prayer power she can get for her and her family. She’s definitely showing her Fighting Irish colors more than she ever has, and continues to demonstrate a remarkable display of high spirits. She certainly hasn’t lost her sharp sense of humor either. She’s been an inspiration to us all, and she gives us all reason to believe she’s gonna kick this cancer in the seat of the pants. She’s in wonderful care with a new facility in Arlington, Virginia- top professionals with incredible bedside manner. Please keep her in your thoughts and prayers. They’ve cancelled performances through mid-October; obviously the cruise may be postponed or cancelled. Not sure what we’ll do if it is – but we’ll worry about that later and just pray for Julie right now.